Here are two Tai Chi programs for children created by Certified Tai Chi Fundamentals® instructors. These are highly recommended and include links to the websites where you can purchase them. These are not sold at taichihealth.com. Tai Chi for Children is a delightfully illustrated book for children, teens or adults with intellectual and physical challenges. Download at the above link. 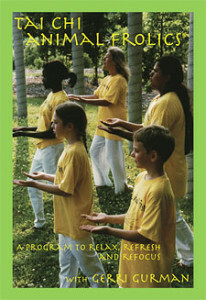 It features adapted Tai Chi Fundamentals® and ROM Dance® elements. Also available for download: Tai Chi for Children book plus Tai Chi Fundamentals® and ROM Dance® video clips. Developed by Nancy H. Lindgren PT, DPT, PCS C/NT, a pediatric clinical specialist and certified Tai Chi Fundamentals® Instructor with over 34 years of experience working with children, babies, and adults, this storybook for anyone who wants to learn more about Tai Chi or may want to inspire a child to try this form of physical activity. Descriptions and illustrations of adapted Tai Chi Fundamentals® Program Movement Patterns. Mindful movement concepts integrated with body strengthening and muscular endurance. Tai Chi Animal Frolics is a movement program designed for the classroom. Ideal for children and their teachers, it blends the wisdom, principles and benefits of Tai Chi with ancient Chinese Animal Frolics exercises. Created by Gerri Gurman MS, integrated arts educator and certified Tai Chi Fundamentals® Instructor with over 40 years experience teaching dance and creative drama, this program is appropriate for most ages, including small children.